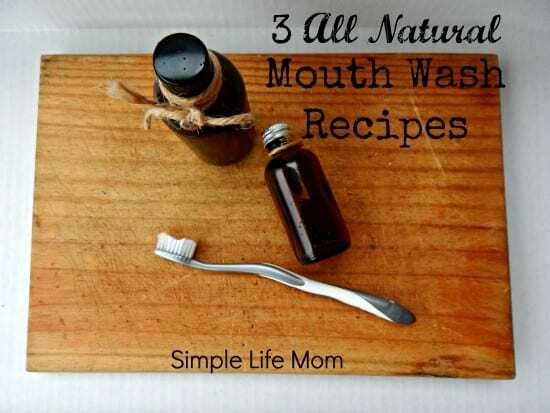 Homemade Natural Mouth Wash is a super easy project that does more than give you fresh breath. 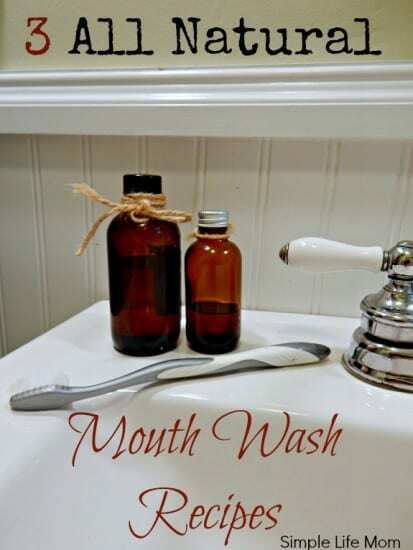 If you haven’t yet, make sure you check out my other article on Mouth Wash where I discuss the many many reasons why you Should Never Buy Mouth Wash Again. 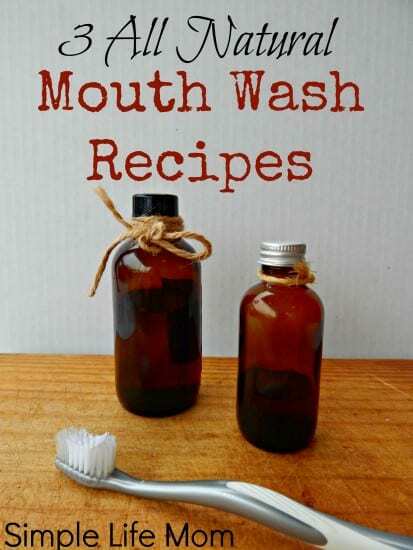 Making your own mouth wash is not very expensive if you already have the ingredients and use them for other homemade projects. In fact, using herbs or oils you already have makes this recipe very frugal! If you are starting off from scratch, it makes sense to use your ingredients for multiple recipes. For example, you may want to consider making other homemade items like an All-Purpose Cleaner, Laundry Soap, Furniture Polish, and even Air Freshener. There are many essential oils and other ingredients that can be used for many household uses, making it a frugal step for your household. When buying from the store, mouthwash is pretty cheap. But as I mentioned above, there are a lot of health reasons to avoid it like the plague! Each of these methods will freshen breath, kill bacteria, and support healthy oral hygiene. Ok, so oil pulling isn’t really a recipe, but you can add various options to your oil pulling routine. Oil pulling is a practice that has been used for centuries (For more information on the ins and outs of the oil pulling discussion see my article: What is Oil Pulling?). All you need to oil pull is a healthy oil, such as coconut oil. Place a tablespoon of oil in your mouth and swish. You may start with 5 minutes to begin with, but try to work up to 20 minutes if possible (swish while taking a shower). Don’t swallow any of the spit and oil in your mouth. Spit it all into the trash when finished. I know some people who put a drop of peppermint essential oil in their oil before swishing. That is definitely an option as well. The motion of swishing, along with the oil in your mouth causes your glands to release toxins and rid your mouth of bacteria. Combine herbs and water in a 8oz glass bottle or mason jar. Pour a small amount in a cup and swish around your mouth for one minute and spit. Essential oils can be used as you would herbs, but you need to remember how powerful a drop of essential oil is compared to a leaf. The oil is much more concentrated and must be used properly. Combine baking soda, water, and essential oil in a 8oz glass bottle or mason jar. All of these recipes will stay fresh for 2 weeks or so, depending on how pure you keep them. Make sure to pour them into another cup before swishing to help them last longer. I love to oil pull. It is a great way to get rid of bacteria in the mouth. How funny. I’m actually pil pulling right now. I find it helps tremendously to be focused on something else while I do it. I agree. I get bored quick so I try to oil pull while I’m showering. GREAT IDEAS! I do oil pulling with sesame seed oil – I may now switch it up with coconut oil and a little peppermint oil. We also make a spray with distilled water and “On Guard” oil that we swish in out mouths regularly. Ohh, I never thought about a breathe spray. What a great idea!! Great ideas to make your own mouthwash, I will have to give the fresh herbs and hot water a try! It’s been years since I’ve purcached mouth wash. I have read great things about oil pulling and need to try it. Thanks for the other 2 options. Except for a very brief period when the kids were teens and “HAD’ to have mouthwash. I have never purchased it. As you said, it’s awful for us! We actually gave it up altogether and haven’t missed it much. Oil pulling is not something I’ve tried. One of these days I may!